And we're off to see the wizard. I guess that is how we start every trip when we leave Kansas, at least according to the new version of 90210. In real life, Toto goes to a kennel and we travel via three airplanes to Billund, Denmark. While not quite Oz, there will be plenty of toys and a lot of wonder. Kate and I will be abroad for the next week- where we will sample smors bread, a kind of open-faced sandwich indigenous to the country (any nation known for sandwiches gets a passing grade in my book). 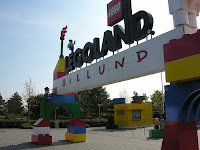 The schedule includes a tour of LEGOLAND, a stop in the Idea House, and lots of interviews with the good folks at LEGO. This is my chance to learn how LEGO bricks are manufactured and the process behind element design. It will be my own private "How It's Made."